Even with all the medical know-how we possess at the dawn of the 21st century, complete tooth loss is still a big problem. In this country, more than a quarter of all adults between ages 65 and 74 have lost all of their teeth. 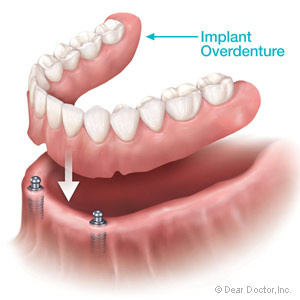 For these individuals, removable full dentures are often still used as an affordable and effective way to replace missing teeth. Simulating natural gums. 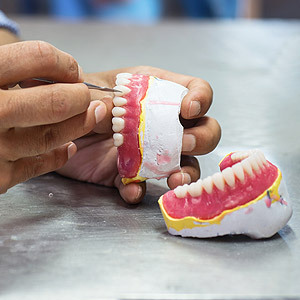 If you are someone with a “high lip dynamic” (a lot of gum shows when you smile), it is particularly important to simulate real gum tissue in a set of full dentures. Fortunately, there are many colors and textures available to create a realistic effect. Again, photographs can be helpful in achieving this. Balancing the bite. We must make sure that your upper and lower dentures come together in a way that facilitates normal biting, chewing, and speech. As a denture wearer, you will need to visit our office regularly to make sure the gum tissue and bone upon which your dentures rest stay healthy. It's common to see a gradual loss of bone in people who wear dentures at a rate that varies from person to person. This bone loss can affect the fit of your dentures and lead to other health problems, which we can address if we are monitoring you on an ongoing basis.